Keyboard Maestro organizes your Macros into Macro Groups which are like folders of macros. Each Macro Group can contain zero or more Macros. Subfolders are not allowed. The most important function of Macro Groups is to control when the contained macros are active. Macro activation can be a challenging subject to master. For a full discussion, please see Macro Activation. You create, edit, and manage Macro Groups in the Keyboard Maestro Editor. Controls are available at the bottom of the Macro Groups Panel, in the File menu, and via keyboard shortcuts. When you create a new Macro Group, the setup for it will appear in the far right panel that normally contains the Macro Action List. It looks like the below screenshot, with the popup options shown to the right. There are many setup options, some representing combinations of options, so if you are not familiar with these, you may want to experiment with each setting to see the details for that option. 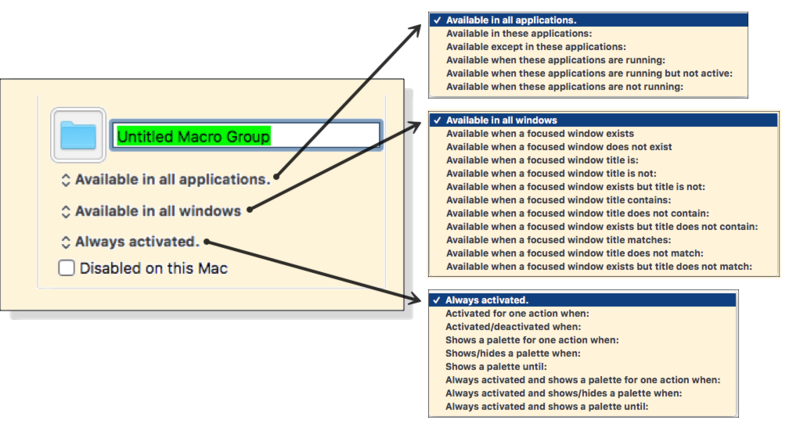 A Macro Group can target or exclude specific applications, which means the macros it contains will only be active in those desired applications 1). By default, Macro Groups and their Macros are active in all applications, that is they are always ready to be triggered. To have macros only active in specific applications, place the macros in a Macro Group, set it to be active in only specific applications and specify the desired applications. By choosing the applications for which a macro is active, you can control more applications with fewer conflicts. For global macros that are always active, use Available in all applications. For application-specific macros, use Available in these applications. To exclude certain applications, use Available except in these applications. Use Available in all applications to be available to an app Launches trigger. Use Available in these applications to be available to Activates or Quits triggers. For Login or Public Web triggered macros, use Available in all applications. By choosing how you activate the Macro Group, you can create sets of Macros for many different purposes. If you want to use the macro globally, configure the Macro Group to be Always activated. If you want to occasionally use a single macro, configure the Macro Group to be Activated for one action or to Show a palette for one action. If you want to use several macros in succession, configure the Macro Group to be Activated/deactivated or to Show/hide a palette. If you want to have a global palette of related macros, configure the Macro Group to Show a palette. If you want the macros to be always active, but to show a palette only some of the time, choose one of the Always activated and shows… variants. For more details see the Advanced Setup at the bottom of this page. Available when any of 3 apps are frontmost. In this case the “Browsers” Macro Group is set for use with Chrome, Firefox, and Safari. You could easily remove and add other apps. You could also chose to make Available in All apps except for a specified list. It is always activated when condition #1 is met, meaning that you can trigger any of its Macros (by Hot Key or any trigger). You can also optionally show a palette of all of its macros by using the indicated Hot Key. There a number of other options, and many combinations you can use. Mail.app that inserts common text messages. BBEdit and Xcode that inserts code chunks or duplicate lines or add #include headers. Alternatively, to have macros active everywhere except specific applications, place them in a Macro Group, set it to be active in all except specific applications and add the desired applications to the list 2). A Macro Group can also act as a container for specific-use macros which are enabled only after a Hot Key press or which are displayed as a palette of the macros 3). Macro Groups can be displayed as a palette giving you a way to build custom toolbars. To have the Macros in a Macro Group always ready to be triggered, set the Macro Group to be activated Always activated. This is the default and you only need to change it if you want to set a group of Macros to be available in a macro palette or after you specifically activate them. To have Macros that are active once only when you specifically activate them, set the Macro Group to be Activated for one action. The Macros in the Macro Group will be enabled when you press the Macro Group Hot Key and will remain enabled only until either any macro is triggered or you press any other key 4). To have Macros that are active after you specifically activate them, set the Macro Group to be Activated/deactivated. The Macros in the Macro Group will be enabled when you press the Macro Group Hot Key and will remain enabled until you press the Macro Group Hot Key again 5). To have Macros that are active and displayed only after you specifically activate them, set the Macro Group to Show a palette for one action. The Macros in the Macro Group will be displayed in a floating Macro Palette and enabled when you press the Macro Group Hot Key and will remain displayed until either any macro is triggered or you press any other key 6). To have Macros that are active and displayed after you specifically activate them, set the Macro Group to Show/hide a palette. The Macros in the Macro Group will be displayed in a floating Macro Palette and enabled when you press the Macro Group Hot Key and will remain displayed until you press the Macro Group Hot Key again. You could use this to create a set of related actions that do not even need a Hot Key 7). To have Macros that are always active and displayed in a palette, set the Macro Group to Show a palette. The Macros in the Macro Group will be displayed in a floating Macro Palette and enabled. The palette will close when you press the Macro Group Hot Key and will remain closed (and the macros disabled) until you press the Macro Group Hot Key again 8). 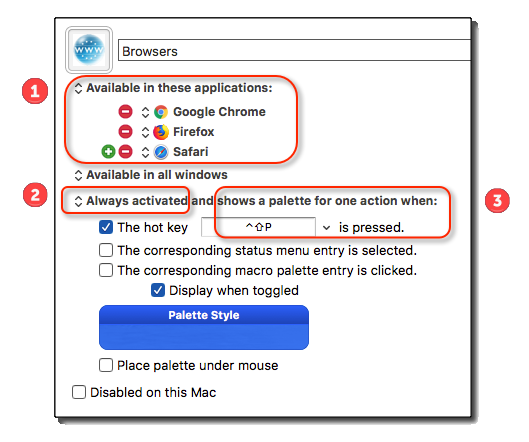 Macro Group activation simply produces "Enabled"
Apply changes to default palette style to Finder's palette? For example, you could exclude macros from triggering in certain games. Also, if you have an application that uses lots of function keys for crucial tasks, you could exclude that application to allow you to use the functions keys for macros elsewhere without conflicting with that application. For example, you could create a Macro Group containing macros that resized or repositioned windows using the arrow keys, but those macros would only be active after the Hot Key was pressed so that the arrow keys could be used normally at other times. You could use this to create a set of related actions with easily remembered trigger keys that will not conflict with normal use because they are not activated until you press the group Hot Key. For example, you could have a group of macros to launch various applications and so that Command-Control-L activated the group, and then a single letter press launched the application (eg M for Mail, S for Safari, F for Finder). You could use this to create a set of related actions with easily remembered hot keys that will not conflict with normal use because they are not activated until you press the group Hot Key. For example, you could have a group of macros to move and resize windows and have Command-Control-W activate the group. Then a single arrow key press moves the front window. When the window is positioned, press Command-Control-W a second time to disable the macros. You could use this to create a set of related actions that do not even need a Hot Key. For example, you could have a group of macros to launch various applications like Mail, Safari and the Finder so when you press Command-Control-L, a palette of these macros is displayed and a single click will launch the application. The macros can still have Hot Key triggers which will be available only while the palette is displayed. For example, you could have a group of macros to align objects in a CAD program, so when you press Command-Control-A, a palette of these macros is displayed and you can click various alignment options (distribute left-right, alight top edges) and then close the palette by pressing Command-Control-A a second time. The macros can still have Hot Key triggers which will be available only while the palette is displayed. You could use this to create a set of related actions that are available in a Macro Palette and displayed by default.